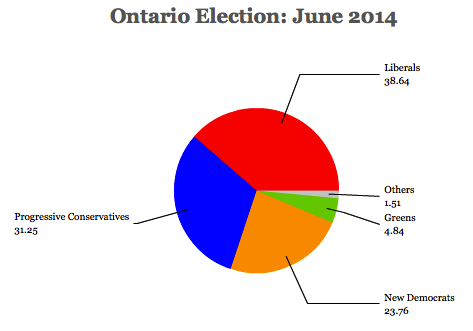 Heading into Thursday’s provincial elections, polls showed that both the center-left Liberal Party of Ontario and the center-right Progressive Conservative Party of Ontario (PC) both had a chance of winning at least a minority government. 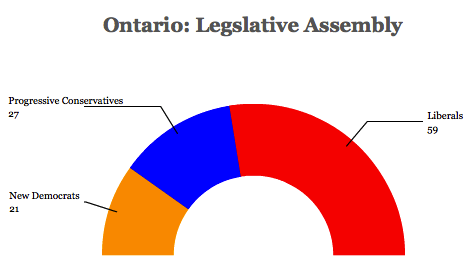 Late-breaking polls on Tuesday and Wednesday, however, showed the Liberal vote creeping up, matched by a decline in support for the progressive alternative, the New Democratic Party of Ontario (NDP). 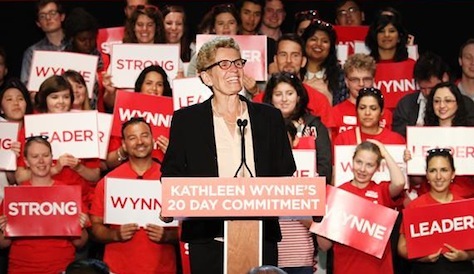 As it turns out, those late polls were spot on, and Ontario’s new premier Kathleen Wynne, who inherited a minority government from her predecessor Dalton McGuinty just 16 months ago, reinvigorated Ontario’s Liberals and won a majority government in her first campaign leading the party.